The Yeonhui-dong (my "Yummy-dong"!) - Yeonnam-dong area is full of authentic and affordable Chinese restaurants, each one with its own flavors and specialities. Like some of its neighbors (e.g. "Ha Ha") Hong Bok serves authentic food from Northeastern China. 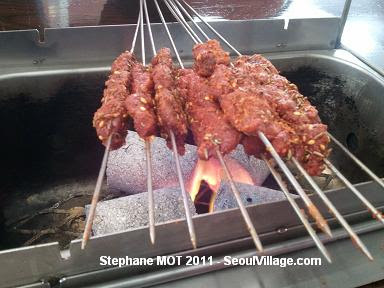 Today, we tried lamb skewers, fish mandu, and hwang mandu from Shandong and Jilin provinces. Fish mandu? a true delicacy, boiled to perfection. Hwang mandu (pork) being filled with big chunks, each ingredient comes with a bang. Lamb skewers taste terrific, and not too strong for Korean palates (many locals have a poor memory of lamb following a doomed promotion ages ago, and the smell of this meat can be an issue). Marinated, seasoned with herbs, and served with paprika, the dish makes you travel even further than across the Yellow Sea. Central Asia, maybe? Don't be afraid to order the set of 14 skewers: each one is not bigger than a tiny finger, and they're fun to BBQ at your table. We started to line them like rows of table football players, but the tenants told us to hold them in packs because it's as efficient, and much less tedious to turn them in bulk. See the small dents on each corner of the stove? You use them to push the meat to the end of the sticks. Hong Bok is on Seongmisan-ro (formerly Dongjin Market street), the first street between Donggyo-ro and Yeonhui-ro South of the railway.